When a catastrophe strikes, it can leave you feeling hopeless and lost. 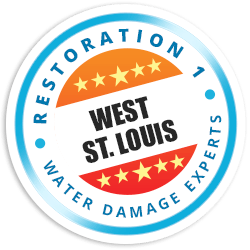 Restoration 1 of West St. Louis provides expert disaster recovery services that restore not only your property but also your confidence. Our certified restoration specialists work hard to turn your home and business stronger than it was before. Allow us to take care of the dirty work, so that you can focus on everything else. Why Hire the Team at Restoration 1 of West St. Louis? When it comes to restoring your home and business, do not compromise. Our recovery experts can help you with tasks such as sewage cleaning, commercial restoration, mold remediation, disaster response, and water damage restoration in St. Louis. Take control of your life and move forward. If you’re ready to get your home or business back, call (636) 429-2228!